Wow what a week! 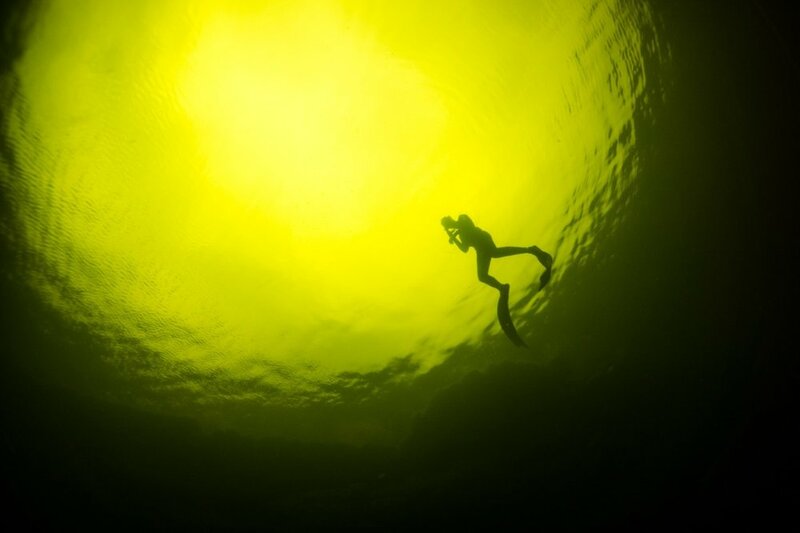 We’ve just returned from an unforgettable, and for some, life changing expedition in Andros. With incredible weather, adventures from sunrise past sunset, this week of exploration was like no other. As this trip was completely sold out many months ago, the majority of us had been on countdown for some time already, and the day had finally arrived. Our excited guests were met and greeted at 11am by Grant, as Tristan was already in Andros awaiting their arrival. Grant gave a warm welcome and handed out our ecofriendly goodie bags which consisted of: A Discoversharks t-shirt, a reusable, sustainable bamboo covered flask from Made by Fressko, a reusable stainless steel straw with pouch from Splat Mats, a bamboo toothbrush from Mable, coral reef-safe sunscreen from Stream2Sea, an ocean friendly bracelet from 4Ocean, bamboo cutlery from U-Konserve, an awareness pin from Cape Clasp, custom made reusable bags from JD Vinylz, packaging-free hair shampoos from Basin, and of course, a limited edition t-shirt from us! After checking out our goodies, we departed Fort Lauderdale, having the luxury of flying on a Tropic Ocean Airways chartered plane. As we approached Andros, we were even given a custom, low-flying tour down the west coast. Our view was jam-packed with vast, unexplored habitat filled with blue holes, incredible reefs, stunning beach shorelines and of course, the promise of the unknown. On landing, we approached the tiny Bahamian airport to find our pre-booked local taxis waiting for our arrival. 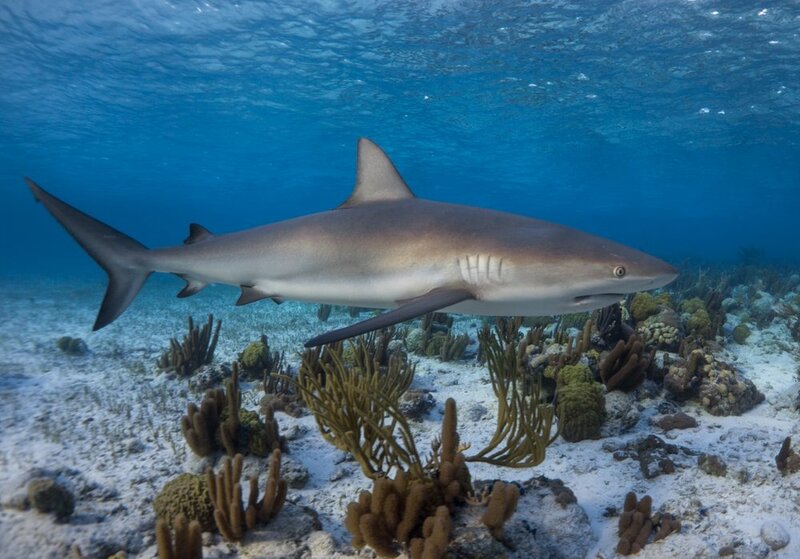 We believe in giving back to the Bahamas, so local taxis, hotels, food, drink and boats are used as we bring ecotourism and a positive voice for sharks into Andros. On arrival to our local lodge, guests met our wonderful captain, Cole from PFO Charters and Juliet, our incredible host from Andros Island Bonefish Club. After a quick hello we unpacked, listened to a safety briefing and trip guidelines/rules from Tristan, grabbed our dive gear and headed out for our first snorkeling excursion at 2pm! We had varying levels of experience within the group, from accomplished freedivers to people who were having their first open ocean swim! With this dynamic we buddied up to safely explore and freedive a local shallow seafan-filled reef, where we baited a little and had two rather friendly nurse sharks and a reef shark grace us with their presence. We stayed until susnset approached. The dusk light and flat calm conditions created some truly exquisite colors to enjoy and photograph. The expedition team relax and talk all things shark after an exciting day on the water! After our afternoon of fun we headed back to the lodge to unpack more formally and settle in to our new home for the week. The lodge is a family owned and run facility, with fantastic food, friendly staff and is placed in an ideal location right on the water. As we watched the sun disappear we all enjoyed A LOT of shark talk with a cheeky local Kalik beer before heading to bed for the night in readiness for an adventurous day tomorrow. All up for a 7.30am breakfast. Each day guests choose a breakfast to suit their needs, from a personal, freshly made breakfast of omelets/eggs or simple cereals, toast, fresh fruit, or yogurt, their choices are plentiful. So, with predicted weather conditions almost perfect we departed at 8.30am and headed to our open water buoy spot, which offered some 3,000+ feet of depth! On arrival, and within fifteen minutes, we were greeted by two silky sharks, yellowfin tuna, and some barracuda! As all guests were relaxed in the water, we enjoyed the silkies and their rather assertive presence! 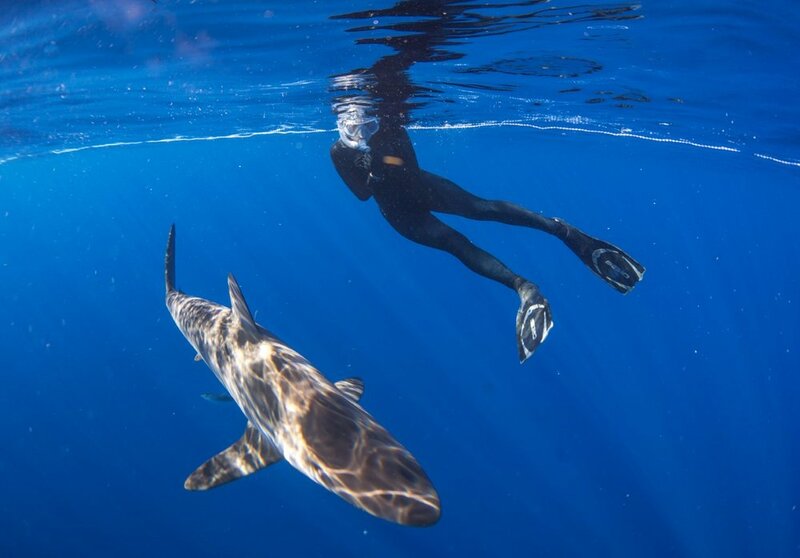 Sharks were swimming within a few feet of divers and seem to explode with energy at the sight of someone freediving or acting out of the ordinary. With everyone buzzing we decided to leave on a high and head in shore to the edge of the drop-off in 45ft of water, and opposite a picturesque cay. Here the corals were stunning; mixed hard and soft with purple seafans taking up prominent positions on coral outcrops. A small reef shark passed through which was not much bigger than the extremely healthy, large-sized snappers and grouper that floated about beneath us. After a few hours of fun our shark-filled morning was wrapped up with lunch and snacks on the boat before moving on to a new excursion site, now affectionately called Cole’s Hole; a silty and cool water blue hole surrounded by turtle seagrass on the sandflats. It’s a bit gloomy for a blue hole, ~6 feet across with cloudy, cool, odd-smelling water. After this we visited The Coffin, a blue hole so named due to its spooky shape, and the visibility was fantastic! Both blue holes were exciting to explore, however the Coffin was a real hit as guests enjoyed gazing down to a seemingly bottomless depth! 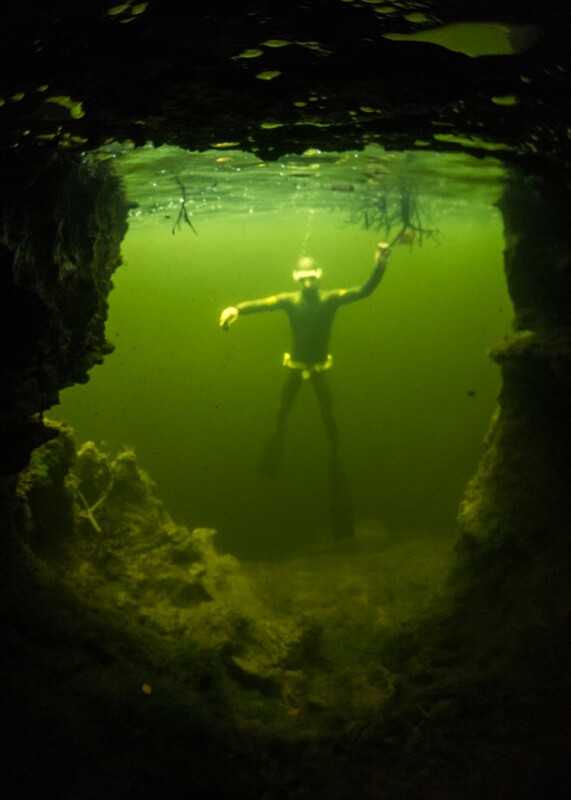 The more experienced freedivers ventured as deep as 20 meters (60 feet), with safety protocols in place, and had fun exploring the eerie depths The Coffin offered! Next up we headed to the inside of Autec channel where after some baiting we were joined by four reef sharks during a snorkel over seagrass. It was a treat to see these reef residents on the flats mixing it up amongst the turtle grass! One noticeable characteristic of all the sharks in Andros is how healthy and clean looking they are, very few with scars, parasites or wounds, clearly the abundant marine life is providing a daily feast for these animals. A tired crew called it a day and headed back to the lodge for fresh water showers, followed by dinner and some excitement viewing the local lemon sharks (three large subadults, approximately 6-8 feet in length) from our dock. The evening concluded with a “Sharks of the Bahamas” talk from Tristan before heading to bed. Rise and shine, an early wake up with breakfast at 6.30am. With windy weather and rain forecasted for much of the day we decided to break the day into two main sectors; morning activities, a break in the afternoon and an evening activity. First up, we headed to a mangrove fringed section of shoreline where a sawfish had been spotted by a local fisher a few months earlier. The thought of bumping into a ray with a caveman weapon for a head gave us the energy to swim against the current that was pumping out of the channels! Lots of life was seen, including some huge, neverending schools of pilchards and some monster mangrove snappers that were taking refuge in the mangrove roots. 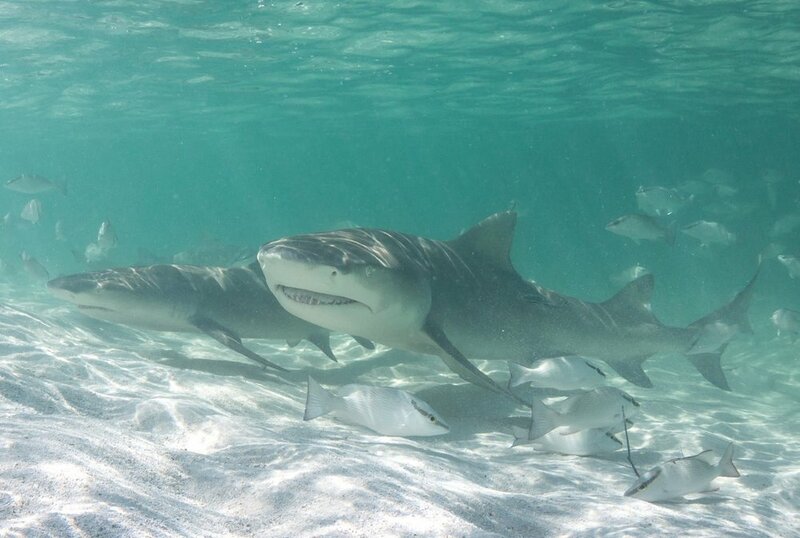 Next, we moved on to Isla’s Point, our lemon shark spot. We set up in the sandy shallows and within minutes we had one small rather skinny looking lemon shark arrive, followed by a 5-foot (140cm) subadult and finally a 7ft (230+cm) adult which appeared enormous against the flats! All sharks were coming in close with the large lemon showing more caution. Eventually she built up the confidence and came in for numerous close passes picking up some food rewards off the sandy substrate. Everyone was buzzing, particularly as the bigger lemon made some very controlled, close passes showing off her beautifully camouflaged lemony color and sweeping tail! A seven-foot shark in two feet of water is a spectacular sight to see. After a very lemon-filled morning we headed back to the lodge for lunch and a rest in preparation for our night time activity. Night-time gillnetting in a location where sawfish had been spotted in the past, as part of our new research project in collaboration with scientists from Florida State University, Florida International University, and NOAA. We arrived at our location, and readied the gear to trek to a gillnet site deep in the mangroves. Sawfish are secretive, cryptic animals, that love silty conditions close to the mangroves, thus for our team to have any chance of success we needed to go to the back of the lagoon! Weather conditions had deteriorated, winds were up and the rain had dug its heels in. In the darkness we sat, telling bad jokes. Cailley dropped some clangers, and despite being in the middle of nowhere, Nick managed an instagram update! 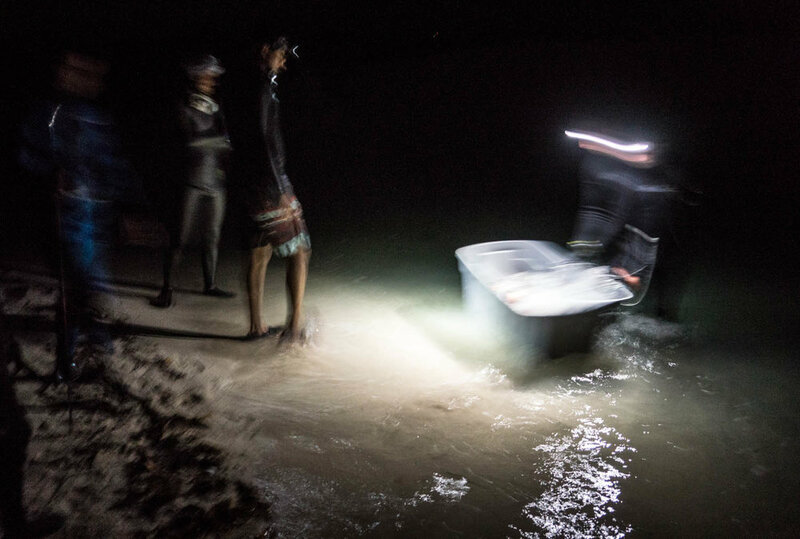 With no captures, although Tristan witnessed a shark break through the net, much of our evening was spent soaking in the warm lagoon water to heat up, or hiding in transport boxes from the rain. Eventually we called it a night and hauled our net at 11pm. A long evening but an adventure nonetheless, building team morale and learning more about each other. The dark, isolated mangroves isn’t for everybody and we were grateful to the team for persevering with our ambition to locate the vanishing, critically endangered smalltooth sawfish. Our search goes on. With our gear packed up, our twenty-minute walk home through the ocean, in total darkness commenced. Once back on land we drove home to our much needed showers and bed with the comfort of a late breakfast waiting on the other side. A late start with breakfast at 8:30am and departure from the dock by 9:30am. Today we headed to an unnamed, inland blue hole. After some light trudging off the beaten trek, our vision expanded from a narrow leafy view to the beautiful, open, and picturesque blue hole. We geared up and jumped right in. Given the hole is virtually unexplored and stagnant we were careful not to touch the sides or bottom, as once the sediment was kicked up the water visibility was nonexistent. During our time here we played around and some guests tried to breach out of the water like dolphins! No prizes on guessing success rates! So, after our exploration we headed back to our lodge for lunch. After a quick pit stop we boarded the boat for an afternoon shark-fishing at a channel in the middle bight known for large sharks. Bingo, within forty-five minutes we had a big nurse shark on our line. He was 202cm in total length and we conducted a full work up of measurements and tissue samples, before tagging and releasing him. Our guests were encouraged to be part of this process and all assisted with the different stages such as taking a fin clip for genetic analysis and length measurements. After our late night and a tiring day on the water we headed home to feast and regain our energy for tomorrows adventures. The Andros Island Bonefish Club always provide wonderful, filling meals which our team appreciated and relished every night. Guests are given a free 30ml tube of Stream2Sea sunscreen - This sunscreen is ocean and coral safe, and tubes are not plastic, they’re made from sugarcane resins! No plastic water bottles here! All guests received a reusable water flask from Made by Fressko for use during their expedition, and beyond! Today we woke up to another day of exceptional weather! Beautiful, flat calm water was waiting for us as we walked to breakfast in awe of the view and conditions that were calling our salty hearts. With such spectacular conditions we couldn’t resist a morning dive with silky sharks at the ocean buoy. This spot was popular with our guests and within twenty minutes we had five silkies and two mahi mahi surrounding our fins. One silky was very small, probably less than a year old and close to three feet in length. Its behavior belied its age with some extraordinarily confident and inquisitive passes, almost nosing Tristan on his mask. All our guests were left mesmerized by this little shark wondering how such a small animal could show such confidence and interest swimming around in the exposed open blue ocean. After our adrenaline filled morning we made a quick pit-stop back to the lodge for lunch and for the afternoon we headed south to a popular cay and channel known for sharks. On arrival we viewed and snorkeled a near-shore blue hole which had an incredibly strong current pumping out of it surrounded by pristine corals and teams of reef fishes. 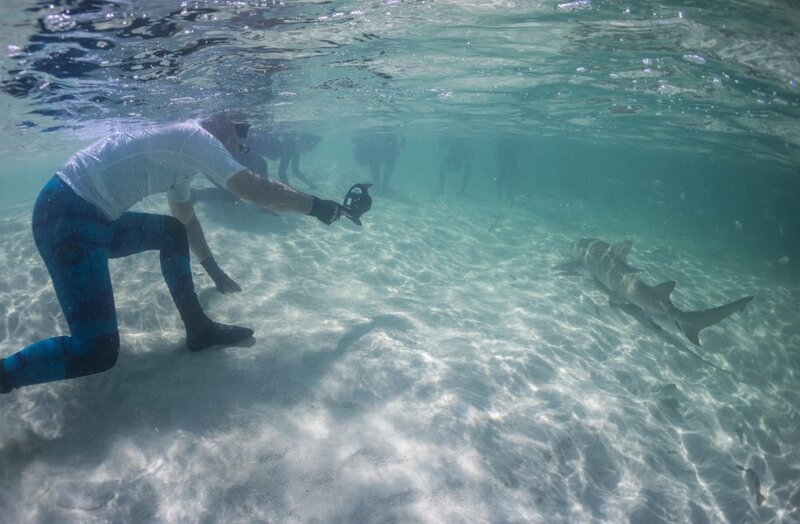 Guests enjoyed exploring and maneuvering around the hole whilst a 6ft lemon shark passed right by our anchor line. After our curiosity was satisfied we moved deeper into the channel and baited for sharks. In total we saw three reef sharks, one lemon and a nurse. While baiting, Tristan had multiple close passes by a large ~2 meter lemon shark that seemed confident on approach and guests were able to see the size of the shark in comparison to Tristan, which was quite the sight! Grant then swapped out and had an amazingly tame reef shark that seemed adamant to ‘hang out’ and approach, unthreatening and almost playfully taking food rewards! The shark swam in over and over again as the guests enjoyed close passes, and calm encounters by this friendly animal. The calmness was however interrupted by a large nurse shark whose presence seemed to encourage competitive behavior between the reef sharks. Guests saw firsthand how situations change quickly and how, as responsible divers, visiting their home, we must be respectful and act accordingly, we all stepped back up, onto the boat. So, after an incredible few hours snorkeling, we called it a day and started our journey home. On route we stopped at ‘Spider Tower’ for a quick snorkel, and guest Cailey decided to lead a climb up for a leap off the tower! Of course others joined (Grant and Alex) in the fun and after a few big splashes (and goading!) we continued our drive home. We arrived back to the lodge for just after 5pm to indulge in some unrushed (for once!) shower time, to clean our equipment and to reflect on a fabulous day in paradise before dinner. After dinner, we all sat down to review pictures and imagery from the day, before an early bed, as we’d planned an early start for tomorrow. Buzzzzz an early wake up for a 7am breakfast as we headed west to the National Park. The weather was INCREDIBLE and we even encountered a bottlenose dolphin on route, probably feeding on sand eels in the shallows. A few guests seized the opportunity to snorkel with the solitary dolphin, who seemed to be more focused on catching breakfast… Nick however couldn’t resist, and so he grabbed the chance to tick swimming with dolphins off his bucket list! Guest Nick ticks of a dolphin swim bucket list item! As we ventured further to the west side there were some fantastic bird watching/spotting moments. Herons, egrets, ibises, vultures, osprey, etc. were all present, and not shy! So, we arrived at our planned location by 8am and on arrival both Tristan and Nick sent their drones up for some searching and exploration from the sky. Some guests watched the drone footage helping to spot, whilst others sat back and enjoyed the vastness of the untouched habitat surrounding them. We even had a baby lemon shark approach us whilst we waited, circling the mangrove roots. After our droning we stopped at our blacktip channel spot and within twenty minutes we had five blacktips approach, three of which had visible external marker tags, likely placed by our collaborator Dr. Dean Grubbs of Florida State University. Our group took it in turns baiting and enjoying exploring and discussing the sharks behavior, as individuals and as a group. With the location being at the tip of channel strong currents meant murky water which prevented us from getting in; although we all thoroughly enjoyed seeing these beautiful sharks from the surface. After a quick bite to eat we opted for some topside searching. We all climbed as high as possible on the boat and began looking for life. Cruising and exploring creeks and waterways is a lot fun as you really don’t know what you’ll see, and often you get teased with blacktip fins breaking the surface or a turtle popping up for a quick breath. With the wind picking up we continued our search, but started our journey home. On heading back east, we stopped at a location known for Andros Rock Iguanas, and we weren’t disappointed with one big male iguana waiting for us, plus several curly tail lizards darting around our ankles. It’s always nice to see life on land after a day in the ocean! Back on the boat and then another short stop off to Shark Hole to deploy Jalil’s underwater drone. Shark Hole is known for poor visibility, so the drone couldn’t pick much up, but the experience was novel and fun nonetheless! We arrived back to the lodge for 5pm and after a delicious dinner the group headed to the Red Door Restaurant and Lounge (a local bar) to play billiards/pool on an old, rather over-used table. It was a lot of fun and guests found it challenging to play on a table with some history! It was particularly amusing watching Grant (all 6’5”) of him attempting to sink a ball with less that a foot between him and the wall! As bedtime called us, we all slowly but surely made our way to our rooms. Day 7, our final day. We woke up to perfect calm waters AGAIN. The weather could not have been better for us and to finish our week with incredible conditions was the cherry on top. As a team we decided to venture out to buoy one last time, and by 8am we had left the dock and arrived on site by 8:30am. 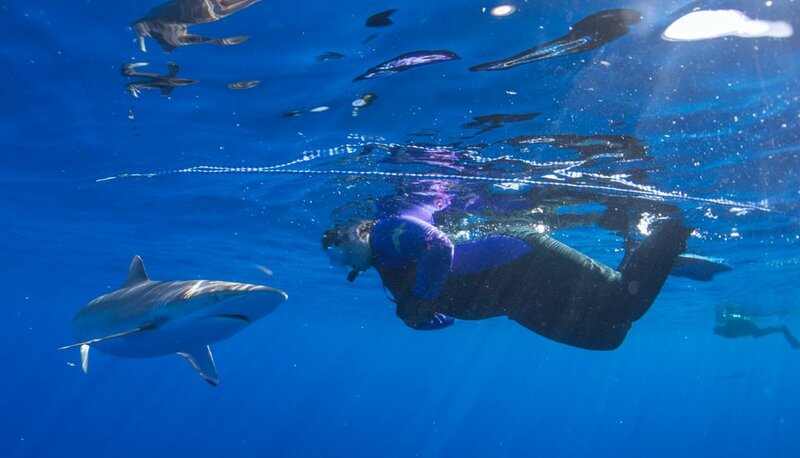 Within minutes we had a few large sharks circling the boat so Tristan and Grant decided to attempt a hand capture (in-water) and an ultrasound (using our prototype waterproof unit developed by E.I Medical) on a large female silky shark. The process was a complete success, the shark was caught, scanned and released within minutes! This species is in trouble globally, being the second most captured shark, targeted for their fins and caught as bycatch in purse seine and pelagic longline fisheries. Data on this species in the Northwest Atlantic is hard to come by due to high mortality on capture, so any information we can obtain is important, especially since -- even as juveniles -- this shark can migrate up to 1000km! Watch out for more developments on this research project! After the ultrasound the group slipped in for their last dive of the expedition where they had three large sharks in perfect conditions, a spectacular dive to end the trip. After our dive we all reluctantly climbed back on board the boat and, as a team, we headed home one last time. On arrival to the lodge we grabbed a quick lunch and packed for our 1pm departure. Sad times. We all regrouped and before we knew it, were placing our bags in the taxies, and heading to the airport. The only positive about the good-bye and journey home is the beautiful flight out of Andros. Viewing the island from the sky is truly breathtaking and ignites a sense of belonging in almost all ocean loving people. 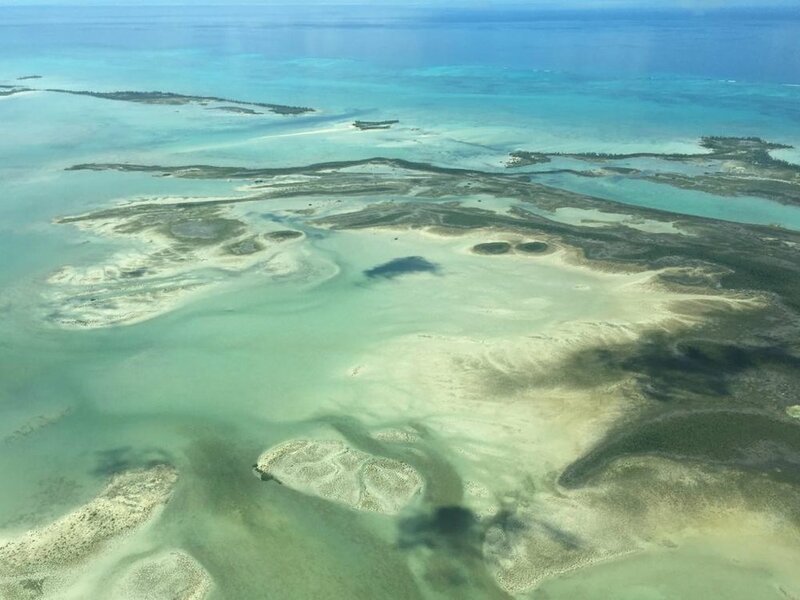 The view of habitat is vast, untouched and unexplored… We are slowly uncovering the secrets Andros holds and are grateful the Bahamians who have kept this special place so pristine and loved. Andros October 2018 crew, come back already!